A team of archaeologists has announced the discovery of over a thousand stone artifacts, with some of them being up to 1.76 million years old. The discovery took place at Wadi Dabsa, in southwest Saudi Arabia near the Red Sea. 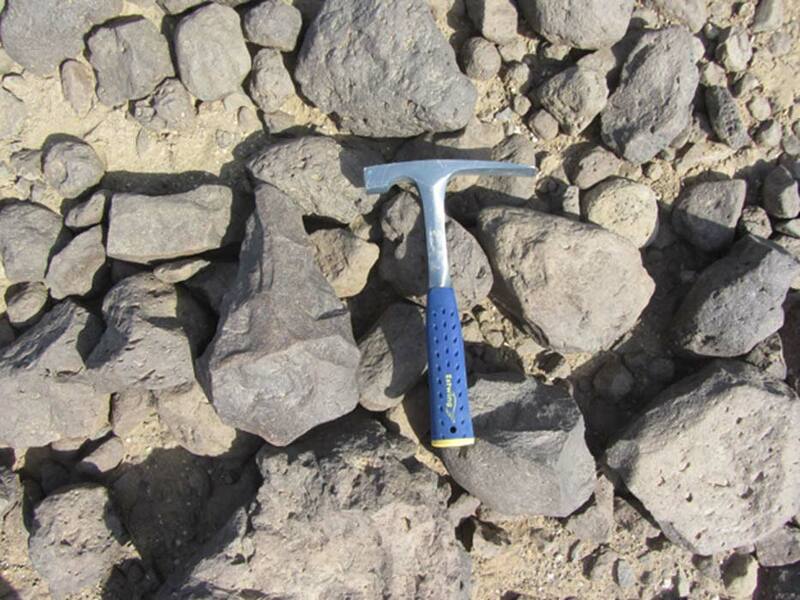 According to the researchers, the stone artifacts were found in a dry terrain, even though experts suggest that the climate there used to be way wetter thousands of years ago. Archaeologists now hope that the new discovery will provide previously unknown information as to how and when different hominins left Africa. The stone artifacts contain the remains of hand axes, cleavers (a type of knife), scrapers that were used to scrape the flesh off of animal hides, projectile points that would have been attached to the ends of spears, piercers (stone tools that can cut small holes through hide or flesh) and hammer stones as Live Science reports . As archaeologists quickly noticed, one of the hand axes is particularly heavy, weighing over 3.5 kilograms (almost 8 lbs). Judging from the tool’s design, archaeologists concluded that several of the artifacts are "Acheulian." The term Acheulian (also known Acheulean and Mode II), describes an archaeological industry of stone tool manufacture characterized by oval and pear-shaped "hand-axes" tightly linked with early humans. Acheulian tools were created during the Lower Palaeolithic era across Africa and much of West Asia, South Asia, and Europe, and are usually found with Homo erectus remains. It is thought that Acheulian technologies first developed in Africa out of the more primitive Oldowan technology as long as 1.76 million years ago, by Homo habilis. Acheulian tools were the dominant technology for the vast majority of human history. As we already mentioned, the researchers are pretty confident that the artifacts date to a period when the climate was wetter in the region. "It's far more arid [today] than it was at certain points in time," Foulds tells Live Science . And continues, "It's strange to be walking over hard, dry rocks which were formed by water pooling during a far wetter period. We think it was during these wetter periods that it's likely the site was occupied." s there truth to the Bedouin Legend of the Great River in the Desert? The site where most of the stone artifacts at Wadi Dabsa were found. The site is now part of a barren desert. It used to have a wetter climate that supported plants and wildlife. However, that’s not surprising to Dr. Foulds, who noted that it has been pretty common for the climate to change in the entire Arabian Peninsula due to the vast changes in global climates that went with glacial cycles over the last 2.5 million years. "During periods when the ice sheets were at their largest, there was widespread aridity in the Sahara and Arabian deserts, but during periods when the ice sheets shrank, the climate of these regions became a lot wetter," Foulds told Live Science . The big question that should concern archaeologists according to Dr. Foulds though, is how these drastic changes in climate affected the spread of hominins from out of Africa. "What's interesting about the Wadi Dabsa region is that the geography of the region may have created a refuge from these changes," Dr. Foulds said as Live Science reports . Dr. Foulds suggested that due to Wadi Dabsa's topography, raining wasn’t as unusual in the specific region as in other dry parts of Saudi Arabia. “Hominins were able to continue living there [at Wadi Dabsa] when they couldn't live in other areas," Dr. Foulds says. What adds to his theory is the fact that researchers have discovered that Wadi Dabsa’s topography includes a basin which most likely would have had streams of water flowing down its slopes, with the water probably pooling in the basin. The archaeological mission is conducting its research as part of the DISPERSE project , which is studying and analyzing landscape and archaeological changes in Africa and Asia in order to understand better how humans evolved and spread out of Africa. The discoveries were detailed in the December 2017 issue of the Journal Antiquity . Please cease pushing the Afro-centric nonsense. Serious people are tired of it. Why do you hate races other than "Negroid"? Out of Africa is a convenient myth used to draw attention away from the fact that 1. human history goes back farther than certain populations would like to you believe, and from different places and lineages than they'd like you to believe....and 2. the fact that the real answer is "we don't know" Saying otherwise is all speculation put forward to try to convince people that specialists know what they're talking about. "I don't know" as an answer doesn't provide grant money, and while it is the most truthful answer, it doesn't provide social status, or the confidence of the people. It was forcing the "I don't know" out of people that led to the death of Socrates. The status quo has always preferred their convenient narratives rather than the truth.